This a question about the outdoor survival show Alone. The teams are allowed to choose 10 items from a list of 40. 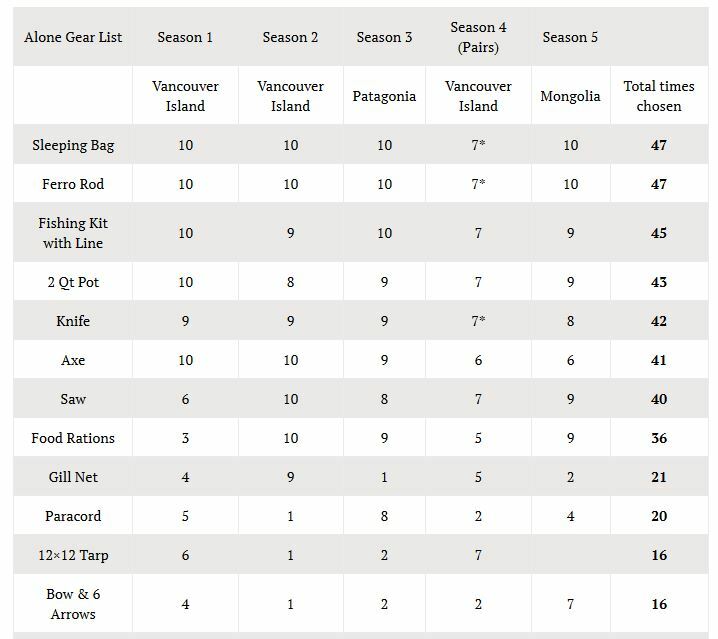 Currently season 5 has aired as of this writing, I have never seen the show, but wonder what items that teams most often choose to bring, from the list of 40? 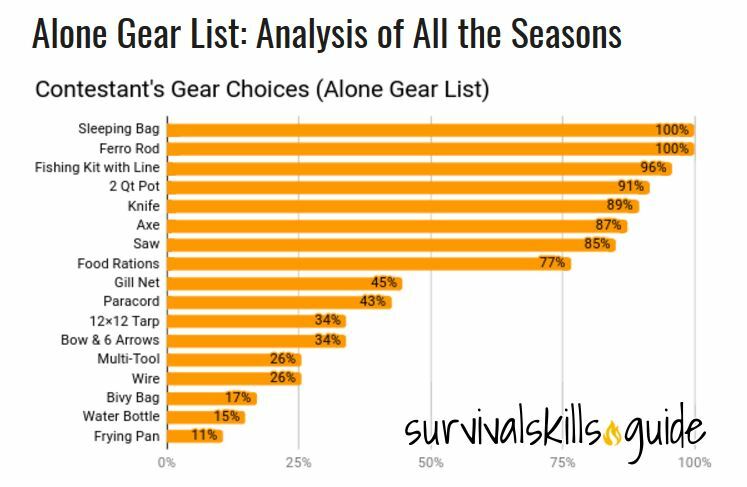 According to the Survival Skills Alone Gear List, the most frequently chosen were sleeping bag (100%); ferro rod (100%); fishing kit with line (96%); 2 quart pot (91%), knife (89%); ax (87%), saw (85%), food (77%). 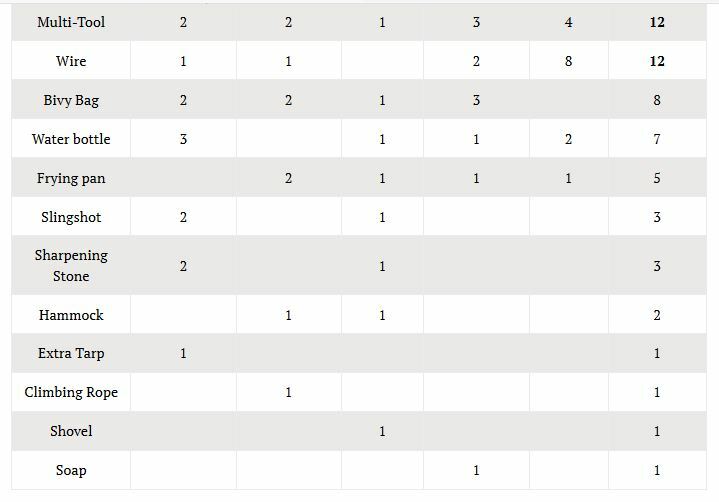 After that there's a significant drop before the rest, which include gill net (45%); paracord (43%); 12x12 tarp (34%); Bow and 6 arrows (34%); multi-tool (26%); wire (26%); bivy bag (17%); water bottle (15%); frying pan (11%). That site sets them out two ways. One is a graph, and the other is a breakdown of each year. Not the answer you're looking for? Browse other questions tagged gear survival or ask your own question. Where are good places to look for water sources when I have run out on a multi-day hike? If injured and lost, what are your biggest priorities for survival? Why should I carry a snow anchor? How did/do scouts venture into the wild? Starting a Fire with a Battery - what are the fundamental guidelines for safety and efficacy? If you are faced with surviving on your own for a prolonged period, should a sling make your short list of hunting tools, and why or why not? SERE Surival Kit includes velcro finger lights, but why?